Holiday Greetings YS Tech Representatives and Distributors! Because of your dedicated hard work, this has been a very good year for us, and we sincerely hope your sales organizations feel well pleased and compensated for their efforts. I would like to personally thank each Sales Professional for their commitment to our ever growing lines. Your efforts in a wide array of markets such as Industrial, Lighting, Audio, Medical, Telematics (telecommunications and computing) and White Goods (appliances) just to name some, are instrumental in helping YS Tech maintain stability in our account base and builds our reputation as a force to deal with in “all-things-cooling”! Even with our double-digit growth in 2014, of course there is still many areas we have only scratched the surface, and others remaining virgin territory – that’s exciting! As you might expect, our cooling fans remain the primary vehicle for growth over-all and that’s good because we are primarily a fan line. However, I would like to take this opportunity to do some PR for our other offerings, mainly Heat Sinks and Extrusions. 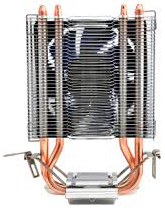 As you’ll recall, I’ve done several Blogs on Heat Sinks and Extrusions in an effort to educate you cooling fan experts of this relatively unlimited market segment which can prove to be a MAJOR business source … ESPECIALLY in the more sophisticated thermal control areas of heat sink / heat pipe designs. And, as you guys may have already seen – in some industries most everyone is concerned with noise and that means slower rotating fans … and … are you ready … MORE sophisticated/efficient heat sink designs! Once you experts get your components designed-in, it is much harder for competitors to come in and undercut your business! OK … that’s enough business! YS Tech USA and CTfanman wish you and yours a very Merry Christmas and Happy New Year!